Caption: ICT apprentices, cadets and grads at this year’s networking day. The apprenticeship and cadetship programs are aimed at students completing year 12, currently studying an undergraduate degree, or looking for a change in careers. They both require no formal IT qualifications or experience — just passion and drive for all things ICT. The programs also offer a great level of support while you study. As an apprentice, you’ll work four days a week while completing a Certificate IV or a Diploma in IT. You’ll gain experience across a range of ICT related areas, including programming, web development and systems analysis and design. If you’re a current university student and have completed your first year (or equivalent) of an undergraduate degree in ICT, or an undergraduate degree with an ICT major, the cadetship program is for you. You’ll work part-time and receive plenty of support while you study. We also offer a graduate program that is open to anyone who has completed an ICT degree within the last seven years. You’ll work full time and be supported to complete a Graduate Certificate in Government Informatics. What’s it like being a part of our program? Meet Naomi, a second year apprentice. She made the move from Perth to Canberra last year and is less than six months away from finishing the program and her qualification. Her journey towards a career in ICT has not followed a straight path. After starting a degree in horticulture and viticulture after Year 12, the travel bug bit and Naomi headed off to Europe. While working mainly in hospitality, Naomi was teaching herself to code using online courses. Despite developing a passion for IT, working in the area was not something Naomi ever expected to do as she hadn’t completed any formal qualifications. Fast forward 10 years and Naomi was thinking about heading home when her sister shared an advertisement for the apprentice program. The program looked like a great way to work towards a qualification to complement her growing interest in ICT. Because the apprenticeship program doesn’t require a specific qualification, Naomi felt confident in applying. I thought this was a great opportunity…they’re paying you to learn which is pretty amazing. Naomi’s application went through all the stages of other apprentices, with a few geographic twists. She did her first interview on the phone while still living overseas and then headed home to Perth. One of the interesting and fun parts of the interview process for all the entry-level programs is the ‘speed dating’. Interviewees move around a room, meeting representatives from different government agencies to learn about the agency and the types of roles available. Although it changes each year, there are usually about 15 agencies looking for cadets and apprentices. Finding the right match of agency and candidate is important and a lot of consideration is given to the preferences of both. Making a good match is one of the reasons more than 80% of participants complete their program. Applicants are usually required to come to Canberra for their second interview and the speed dating, but as Naomi was some distance away, she attended remotely. This meant she was on a laptop screen and was moved around the room to meet each agency! The speed dating was a great experience…even though I’d already worked out which agency was my favourite! Naomi was one of 45 successful applicants for the apprentice program who started in 2016. She picked herself up and moved to Canberra—not quite as far as Germany, but still a big move. Although the majority of cadet, apprentice and graduate positions are located in Canberra, positions can also be available in Sydney, Adelaide and Melbourne and Brisbane, depending on the needs of government agencies in those cities. In 2018, both apprentices and cadets are needed in Canberra, Adelaide and Sydney with apprentice positions also available in Melbourne. Now Naomi is studying for a Certificate IV in ICT at the Canberra Institute of Technology and works four days a week in her agency. She’s found the work interesting, varied and has uncovered areas which really interest her—coding and networking. The benefit of the cadet, apprentice and graduate program is the opportunity to move around an agency, learning different skills in different areas, and finding that area of most interest, whether it be data science, web design, frontend and backend developing or cybersecurity. Something we hear from apprentices and cadets is that the public service is not what they anticipated. It is more creative and exciting than they expected, with the opportunity to work in a variety of areas and build up diverse skills. Naomi is supported to work on her own projects, but also finds her colleagues are ready and willing to share their own knowledge. I listen and I learn from my colleagues. They take me along whenever they go to do things. Naomi has also been able to take advantage of the extensive in-house training offered by her agency, as well as the learning and development opportunities offered by our program. 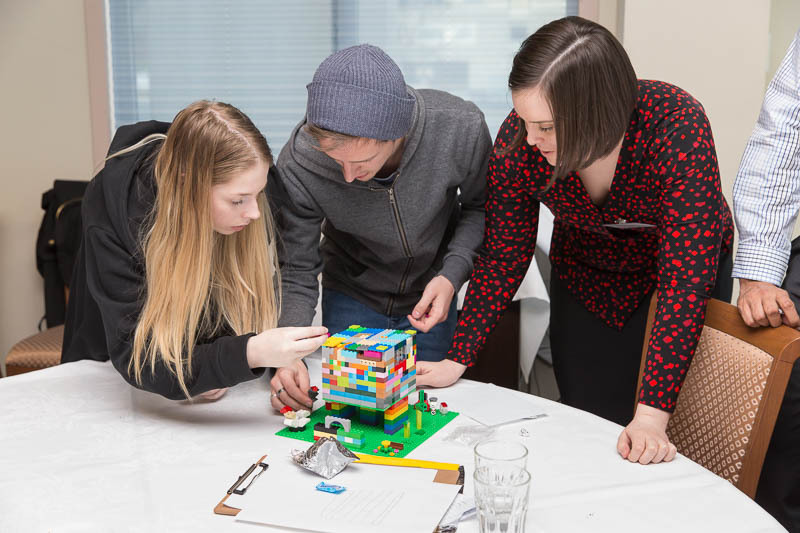 You may think there is no creativity in ICT but the Lego towers built at the recent training day would beg to differ! Throughout her time as an apprentice Naomi has completed courses in interview skills, time management, and public speaking which she says has helped build her practical work skills and confidence. Naomi will complete her apprenticeship in December and plans to stay with her current team. And her advice to those considering applying for a position as an ICT apprentice or cadet? Go for it! It’s a really good opportunity for people who have a passion for IT but don’t yet have qualifications. It’s certainly an industry to get into. It is a part of everyone’s lives now. Keep an eye out on our DTA Facebook page over the next couple of weeks to see other apprentices and cadets talk about their experiences. You can also follow the ICT Entry Level Program Facebook page for updates about the program including online Q&A sessions. Charmian is part of our team who manage the ICT Entry Level Programs. She is also a Career Development and Support Officer who support the cadets, apprentices and graduates during their program.